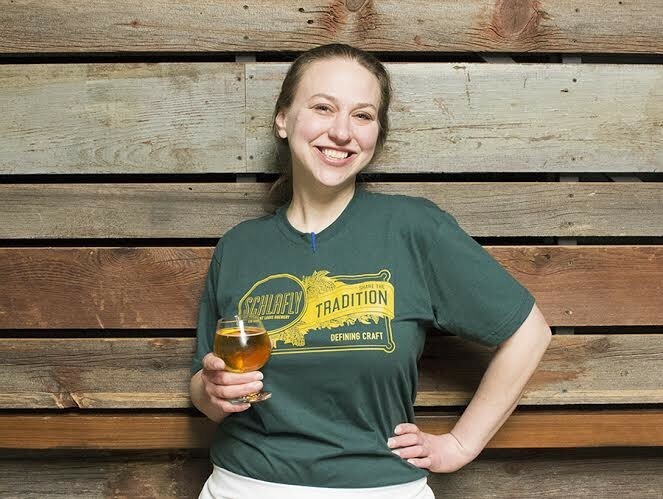 KT Ayers, executive chef at Schlafly Bottleworks. KT Ayers, the new executive chef at Schlafly Bottleworks (7260 Southwest Ave., 314-241-2337), got her first professional cooking gig at the age of five. "I made a chocolate layer cake. Mom certainly tutored me, but I made one for my pre-school graduation and we sold the other one at our restaurant." "Our restaurant" was Riddle's Restaurant, near the corner of Hanley and Natural Bridge Roads, which her parents opened when she was in pre-school. "I grew up in the kitchen," Ayers recalls. "As soon as I was tall enough to reach the counter, I was cooking." Her parents started paying her when she was fourteen, and she continued to learn the ins and outs of the business as she came of age. Though she briefly studied anthropology at the University of Missouri-St. Louis, Ayers knew that she was destined for the kitchen. She left college and partnered with her parents to move the restaurant to the Delmar Loop and rename it Riddle's Penultimate. Eventually, she bought her parents out and took over the operations on her own. Ayers is not comfortable discussing Riddle's demise, saying only that it is too painful to talk about. 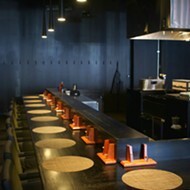 She admits, however, that she has grown as a cook in the years that have passed since the restaurant's closure. "I worked at Annie Gunn's for two years and learned so much there," Ayers explains. "I also got a chance to work for the Purple Martin and am so proud of what we all did there." Her resume also includes a gig in restaurant consulting and a brief stint at the midtown Mexican restaurant Lucha. Still, she feels like she has been in limbo for some time. "I feel like I was bouncing around," Ayers says. The veteran chef wasn't looking for job when the Schlafly offer came. "Some of the people at Schlafly are family friends," she explains. "I would just go in for lunch and hang out. A conversation just started. Now, it feels like I have finally come home." Next week, Ayers will roll out a new menu that uses more beer in the cooking process and emphasizes the brewery's commitment to sustainability. "I have a really good 'in' with local produce," Ayers says, laughing, and then admits, "It's my dad. He is a produce purveyor and works with small farms and all things local. Dad has his finger on the pulse of what's in season, so that's helpful. But really, I am just happy to be working with him again." Ayers took a break from the kitchen to share her thoughts on the St. Louis food and beverage scene, her commitment to good dental hygiene, and why her mamma will always be her food crush. That when they speak with condescension or affectation, I am definitely going to make fun of them later. One hundred percent chance. I have a whole, involved, time-consuming dental hygiene routine that would probably seem pretty OCD to the casual observer. But we use our mouths a lot, so I try to take care of mine. How awesome would it be to have that Bewitched thing, where you can freeze the whole room into suspended animation, go monkey with something, and then snap, return to life as we know it? I could do so much with that. I’ve seen a lot of creativity and playfulness incorporating interesting liqueurs and cordials in cooking lately. Chefs are no longer content to just cook with table wines these days. A little spritz of a slightly esoteric brandy or digestif opens up some really fun possibilities, and I enjoy that trend quite a bit. My mother, Paula Ayers, is no longer in the restaurant industry. (She put in a solid few decades, though.) But she still does wonderful, creative things in the kitchen, that always let the high quality of the ingredients shine. Her food always looks pretty, too, which matters. She cooks clean, and has never taken a shortcut in her life. I gotta give it to my mama, that’s HER superpower. I’m pretty excited to see what Samantha Mitchell is going to pull out of her hat with Farmtruk. She’s a genuinely passionate and talented woman, and the time is right to bring this concept to the streets of Saint Louis. The sky’s the limit there, and I can’t wait to get some! Good coffee contributes complexity and depth to an entire spectrum of dishes. I’d like to think that I, too, am bold, strong, and versatile, and can play a starring or supporting role, as suits the situation. I’m already a part-time crazy cat lady. If I only worked 40 hours a week, I might really end up on one of those intervention shows. It could totally get out of hand. Easy. Imitation maple syrup or “flavoring” – I can’t abide the stuff. It turns everything it touches into a knockoff fast food breakfast sandwich or something. It’s not good in anything. My god-sister and I live very close. Whenever our schedules permit (often), you can find us with a fire in the fire pit, wine flowing, and the music cranked. Good clean American fun! Guilty indeed! Frito's Honey BBQ Twists. I don’t know what the deal is, but those things are my Kryptonite. I just steer clear of them, because I have no willpower against them. A loaf of salted dark rye or Pumpernickel bread (I grew up on Lickhalter’s) and an obscene portion of duck liver pate, with pickled onions. Give me a couple pints of nice dry cider and let me die happy.